Houses and heavy items are individually priced. 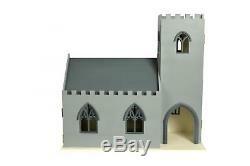 Dolls House Village Church Welsh Chapel 1:12 Scale Flat Pack MDF Wood Kit. British made - MDF - Flat packed and unpainted ready for you to decorate in the style you choose. This item is suitable for new or experienced collectors and for children over 14 years of age. Bell tower with front opening. Front and roof opening for church. Overall sizes (W x D x H). Bell Tower - Height 765mm (30.25 inches). Church - 465 x 825 x 535 mm (18.5 x 32.5 x 21 inches). This lovely church has beautifully designed windows and the inside roof has realistic rafters. 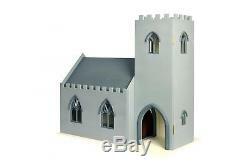 Altar, pews and lecturn can be bought at Melody Jane Dolls Houses. SKU: DH008 / Barcode: 8800159377143. Our products are not playthings and are not meant for children under the age of 14 years. These items are intended for adults to use in the construction and accessorising of dolls houses and similar projects. Use by children under the recommended minimum age could present choking and other hazards. Parental supervision is strongly advised. Over 4,500 Stocked Items With items added every day, you're bound to find what you need! We've got you covered! 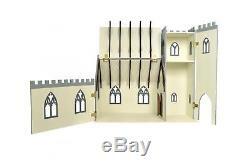 The item "Dolls House Village Church Welsh Chapel 112 Scale Flat Pack MDF Wood Kit" is in sale since Tuesday, October 30, 2018. This item is in the category "Dolls & Bears\Dolls' Miniatures & Houses\Dolls' Houses". The seller is "melodyw41" and is located in Abergele.